E. Dakota: Accesorize Your Friends & Family. Accesorize Your Friends & Family. I realized post post the other day that all my gift suggestions were accessories. Well... Im not done yet. Of course there are plenty of other categories we can cover, but for now, I have have three more accessory lines for you. The good news? You don't have to choose a size, they mail easily, and most people need to jazz up their everyday a little but. Since I posted L&H's flower pins first the other day, here are more flowers for your wardrobe. 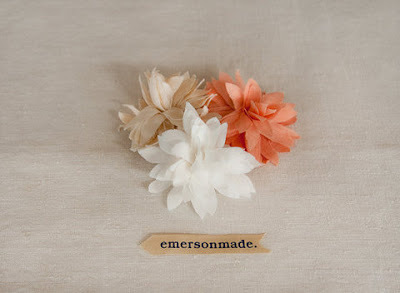 They are by Emersonmade, and come in a variety of shapes and sizes. I think for myself I love the big blooms, but they might be a little aggresive for some. Above is the Ballet Dahlia (which I might have chosen on name alone). Then there is Jewelry by Beth Lauren, which, if you've spent any time with me, you know I wear my pendant necklace all the time. This line makes great gifts because it isn't over the top expensive, but it is unique, beautiful, and delicate, and most pieces work over a white tee or a cocktail dress. I can never get enough, and have given it as countless gifts, which I see people wearing all the time. You can keep your eye out for some of her pieces at Anthropologie too :). And last but not least is a line that I just discovered recently when the designer was at Sunday Suppers. Again, afordable and different, plus I love saying the name. You can check out Bonbon Oiseau here.